Thursday 19th January 2017 sees the launch of a new board game café event in Albert Road, Southsea, Hampshire UK. The event is being hosted by the Hunter Gatherer Coffee shop, which since its opening has been host to artists, musicians and designers and is very family friendly as well as sporting their own crafts boutique. They are a team with a passion for great food, excellent coffee & local and sustainable business, making them a perfect place for games and fun. The first game event to be held will be aimed at everyone who loves to play board games. We will be providing nearly 50 traditional and some new board games as well as some brand new games in development. The event is free to join in with and you are welcome to bring your own card and board games. If you already belong to a games group, you will be most welcome. If you’ve never rolled a dice in your life, you’re also very welcome and people will be on hand to help start a game. If you’re a master at Rummikub or ‘Settlers’ bring your game and start up! Hunter Gather will be providing a special evening menu and their range of amazing teas and coffee will also be available to purchase. There will be a menu of light snacks available, which will also cater for vegetarian diets as well. There will be opportunities to buy copies of some of the new games that are being played. We will be starting at the Hunter Gatherer Café on the 19th Janurary in Southsea at 7:00pm and the event will finish at 9.30pm So we look forward to seeing you there! Below is a list of the games we will be providing. Regular Hunter Gatherer Opening Hours: 8am – 5pm Tuesday – Saturday, 9am – 4pm Sunday, Closed Monday’s. Read about how Hunter Gatherer came about. WHAT IS A BOARD GAMES CAFE? This idea of the board game café is first and foremost to have fun. We are want to also want to highlight the benefits of board games as a social activity. We feel that board game cafés are essential for introducing new games being developed and help promote independent games makers. We started working with independent games designers in 2016. Since then we have been looking at developing games for our customers for engagement and education as well as extending the stories we publish into new games. Line is a new card game of skill for Skateboard fans. The card and board game industry has exploded in recent years and we feel it is a growth and innovation market opportunity. 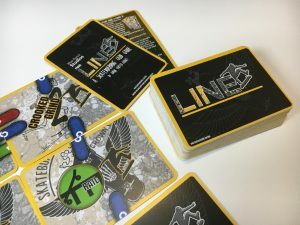 We are excited about Line, a new card game designed in partnership with Adam Carter-Groves, a video game and board game engineer and have been working hard to promote other games makers as part of the Digital Arts Programme run by Eastleigh Borough Council at the Eastleigh Tec Hub. We have been supporting the Board Game Café at The Point Theatre, which is now attracting a great group of new generation and classic game players. We at Blue Donut Studios see card and board games as an exciting business opportunity but also as a whole heap of fun! Are you looking to make a new Board Game? We are on the look out for talented new games makers with new ideas and look forward to helping them bring their ideas to market. The Board Game Cafés will enable them to test and refine their games with the public and people get the chance to be play testers and have a great evening. Are you a games retailer? We are also keen to form partnerships with toy store and board games retailers looking to provide their customers with different games and cross-media products that helps boost their sales. We believe that working with retailers and consumers we can all work to create a sustainable model for creation and consumption of games and provide a platform for people to make and sell games. As part of our business plan we are working on a trade and retail e-commerce platform for buying direct from Blue Donut Studios. Retailers will be given online account access to buy at trade pricing whilst being able to provide store information for us to help promote them and encourage footfall into their stores. Sign-up to find out more about the retail opportunities with Blue Donut Studios.